Beacon Falls, CT – June 25, 2013 – Citing the company’s reputation for delivering high performance reliability, Ziker Uniforms (www.zikeruniforms.com) of South Bend, Indiana, has purchased a TT-756G, 450-pound capacity dryer from Lavatec Laundry Technology (LLT). The announcement was made in LLT’s booth at Clean 2013, held June 20-22 at the Morial Convention Center in New Orleans. Owner David Ziker represents the third generation of the family owned business started by his grandfather in 1917. The TT-756G replaces a previous Lavatec dryer that was installed in 1994. It will be used in the South Bend process facility that handles work for the industrial uniform rental business and work in conjunction with an open pocket washer extractor system. Mr. Ziker also owns Ziker Cleaners, which has nine dry-cleaning locations and services customers in the high traffic areas of northern Indiana, northeast Illinois and southwest Michigan. The TT-756G dryer has a high quality design with superior, state-of-the-art ergonomic and surface quality features. Durable and built to provide long-lasting performance, the dryer comes equipped with infrared sensor technology that reduces energy usage dramatically. 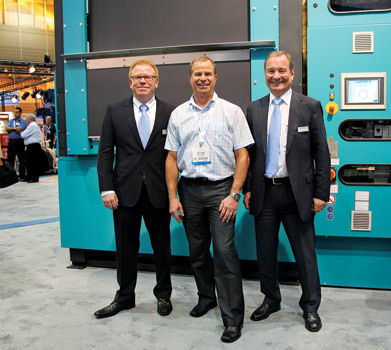 Standing next to the new TT-756G dryer at the Clean Show are, from left to right, Mark Thrasher, President of Lavatec Laundry Technology; David Ziker, owner of Ziker Uniforms in South Bend, Indiana; and Wolf-Peter Graeser, CEO and Managing Partner of Lavatec Laundry Technology GmbH.